Film crews from the US and South Africa are about to put Friends of the National Parks Foundation’s (FNPF) conservation projects in front of a global audience. Crews from the US’s award-winning Born to Explore with Richard Wiese and South Africa’s Earth Touch TV recently visited our bird sanctuary project on Bali’s Nusa Penida island. 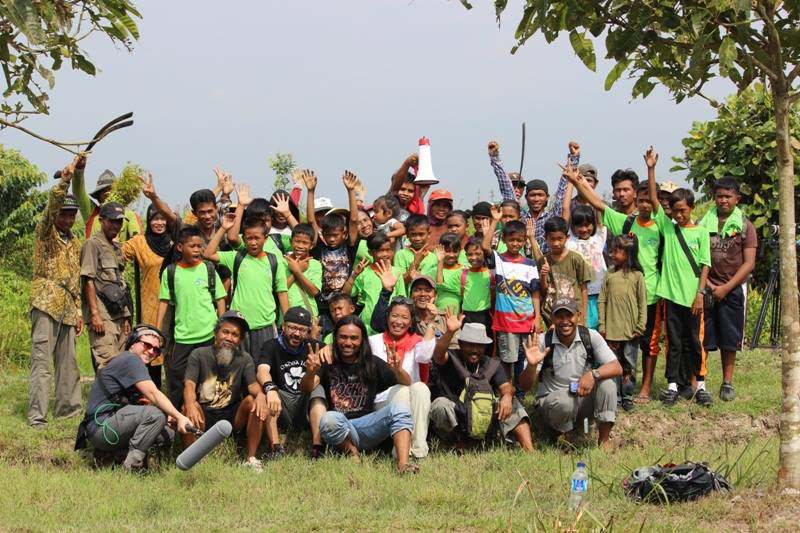 The Born to Explore crew also spent a day with our project team in Kalimantan, Borneo. Read on to learn why they came and what they thought. First up with talk with Born to Explore’s host and adventurer Richard Wiese and executive producer Mercedes Velgot. The Emmy ® award-winning travel and adventure program, which is broadcast on ABC, is watched by 1.5 million every week. Why did you choose to visit us? Mercedes: Our show is about people, places, and the planet. We have traveled to many places ranging from the North Pole, Africa to South America. We look for very authentic experiences: authentic wildlife, authentic culture. Our friend Richard Zimmerman, Executive Director of Orangutan Outreach, suggested FNPF and the fantastic reforestation work you and your team are carrying out. Mercedes: There are so many. I think one of the biggest highlights in Tanjung Puting was Basuki (our project manager in Kalimantan) – he is so passionate about the forest. He almost moved us to tears when he was talking about the destruction of the forest. He showed me the line where a bulldozer had been digging, and to the right the planting area. With one permit the forest has gone. After spending so much time, effort and love planting trees in the heartbeat they can be gone. On the other hand, there is optimism. I am not sure that in our generation change will happen, but with the education of the children hopefully their generation will make a difference. Richard: The highlight was seeing the orangutans in their habitat – it was an emotional experience. For most people at home thinking about these great apes of Indonesia (the orangutan) is something so far away from their world … but once you touch the soil, interact with the local people and you see the animal, you understand. Highlight on Nusa Penida – life is very basic here and for me that is part of the highlight. That’s something I will take at home with me, a good memory. Mercedes: It is always one person’s vision, one person’s dreams that make a difference. No matter where in the world we go we met people, like Dr Bayu (FNPF’s Founder and CEO), who have a vision. It is really hard to get funding and the romance of it all is very different from the reality of the hard work. But it is obviously working well in Tanjung Puting, from the inspiration of one person. Mercedes: We will take away memories of the beautiful scenery, the magnificent orangutan, and people who are warm and genuine. And we will come back – we don’t say this about every place we go. Richard: How we treat animals shows how much we respect for ourselves. Next we talk to Kirsten Horne, online producer and writer, from South Africa’s Earth Touch TV. This award-winning company produces nature documentaries which have appeared on TV and online screens all over the world. Their philosophy is that nature’s stories should be told with passion and imagination. Why did choose to visit us? Kirsten: I heard about the Bali starling project and was really interested in the fact there’s only a few birds left. Also it is clearly a success, from 10 birds a couple of years ago to hundreds now. It’s absolutely remarkable. I wanted to see the project and I hoped to see the birds in the wild. A lot of people have breeding programs, but to see these beautiful birds in the wild is very hard – to see any endangered bird in the wild is just phenomenal. Why are you passionate about these issues? I am happiest in spaces where there are trees and wild animals in their natural habitat. I do not understand why humans want to keep animals in captivity. There’s nothing more beautiful than seeing animals in the wild – and nothing more special and healing for humans than to be in the wild where animals are free. Reforestation – it’s awesome. I think word is getting out about what FNPF does. The fact that local community awareness is increasing, and they now come to foundation (FNPF) to ask for seedlings (is great). By doing something positive it proves that people want to help, even in a tiny way. I think that’s amazing. I agree with FNPF’s community programs which give people alternative sources of income so they don’t have to poach. At the end of the day, the local communities are the ones protecting wildlife species, not people sitting in offices. I loved the goat (microfinance) project – they are getting a basic need met, and a reason not to poach. And of course the Bali starling – I’m always obsessed with birds – and the starling’s eyes are so blue and beautiful. What do you think about our work? Fantastic! Bayu’s knowledge and passion are just extraordinary. He is real warrior for wildlife and the environment. Born to Explore’s programs featuring FNPF will appear in the US in February and May. 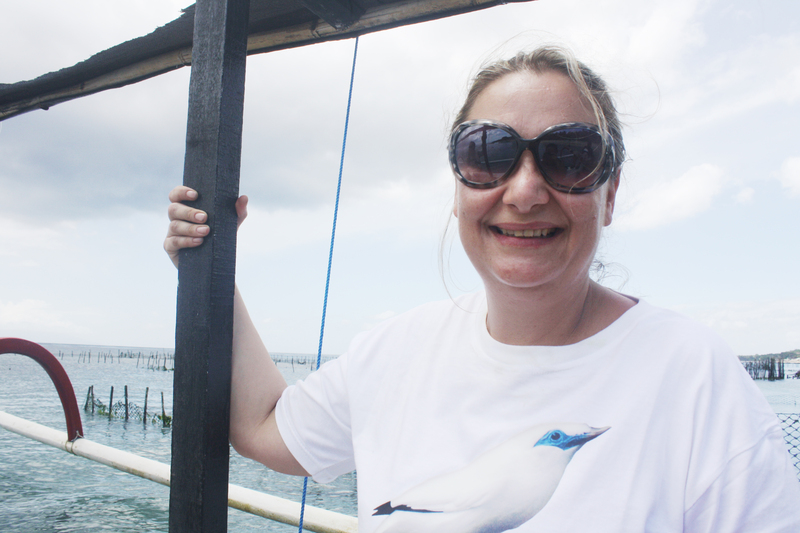 Earth Touch’s story on the Bali Starling will be available online in January 2014.